As is my tradition, it is time to count down my favorite images from the past year. Since it is 2013, I’ll share 13 of my favorites with you. Let me tell you – it was incredibly difficult to narrow the choices down this year, so I have 13 favorites and one honorable mention. 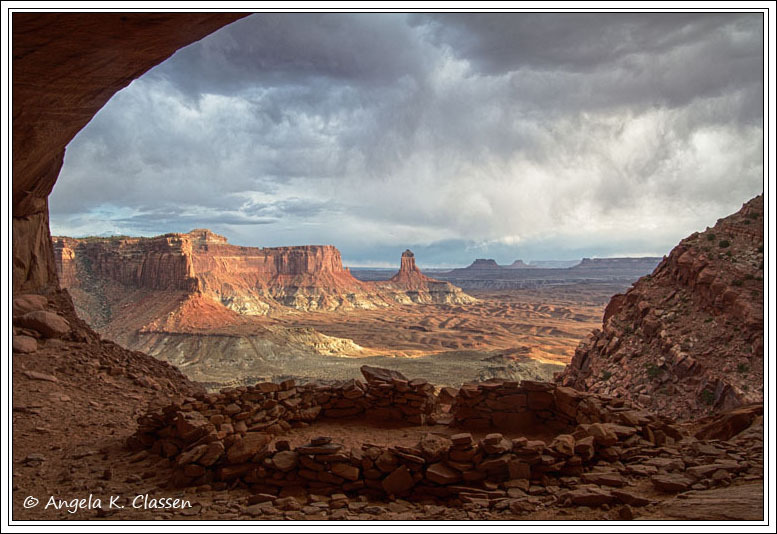 I had a spectacular photographic year, with trips to Arches, Canyonlands, Crested Butte (TWICE during PEAK wildflower bloom! ), Rifle, Glenwood Springs, Steamboat (twice), Mesa Verde, Maroon Bells, and countless visits to my backyard gem, the Colorado National Monument. I went out once to shoot Christmas lights with 3 other members of Thunder Mountain Camera Club and finally figured out how to do them the right way. It was extremely cold (temps hovered near zero the entire time we were out) but it was fun. Dawn Morrow, the organizer of the outing, had pre-scouted some awesome places for us to visit. My favorite place was the “blue house” on 26 Road right off I-70. The next weekend, I went back and reshot a few things I missed the first time. I got this shot that time. I really liked the composition and how the lighting turned out. 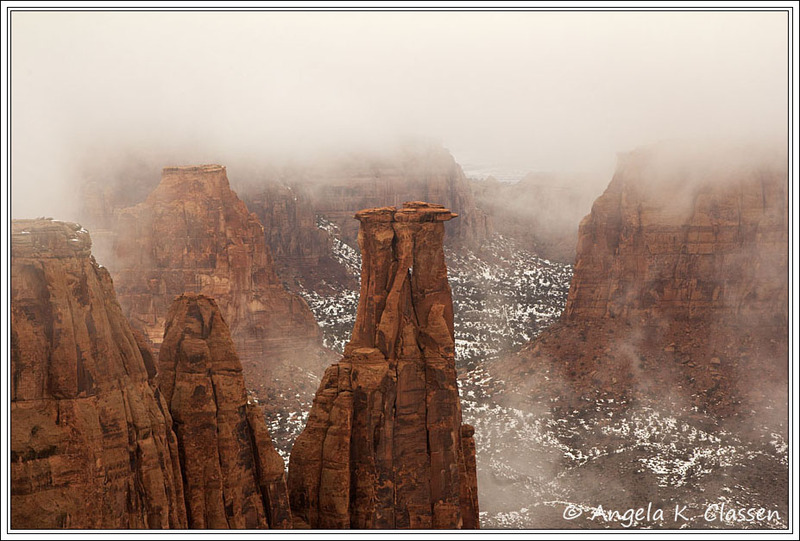 I’ve wanted to capture fog up in the Colorado National Monument and finally had a chance early in 2013. It was eerie to sit and watch the fog move though the canyons, almost like a live being, and the silence was overwhelming. I captured this image at one of my favorite shooting spots, the Monument Canyon view. 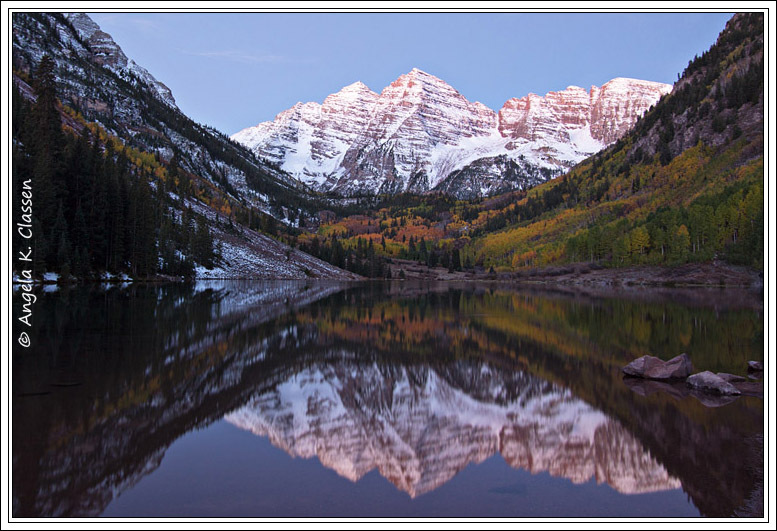 This image was selected for the CNMA annual calendar as a grid photo and was also selected by the Bank of Colorado for their 2014 scenic calendar. Several of my camera club friends started chasing lightning when the monsoon arrived. I finally decided I should try, and went up to the Monument chasing a small cell that was throwing off a little lightning. Unfortunately by the time I got up there, the storm fizzled… I drove past Independence Monument, then Kissing Couple, hoping the storm would fire up again, but it didn’t. A little past Kissing Couple, I decided to turn around. I came around this corner and WHAM! This rainbow was right in my face. Luckily, there was a spot just big enough for my car so I pulled off and started firing furiously. The rainbow never did fully form, but in this context it really didn’t matter. I had planned to visit Steamboat the first weekend in October and man, did I time that right! I arrived on Friday and it was still snowing – AND colors were at peak! What an incredible weekend I had – probably one of my most memorable. It was made better by the fact I got to hang out with several photographers from Nature Photographers Network (Rod Hanna, Monte Trumbull, Ken Henke and Stephen Trainor). They graciously let me tag along (actually, they drove which was great because an experienced 4wheeler – in snow to boot – I am not), we ate several meals together, talked shop, and shot hundreds of images together. Rod has lived in the Steamboat area for decades and knows the area like the back of his hand. He knew exactly where and when to go. This image was shot literally roadside on the second day. 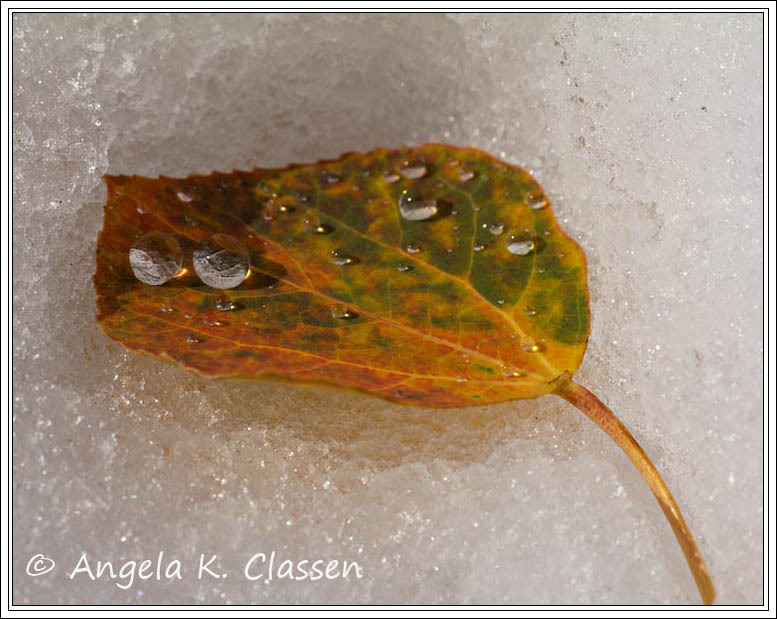 I spied the leaf lying in the snow and noticed the big water drops, so out came the macro lens. I love how the leaf has all colors in it – green, yellow, orange and red. We went to Crested Butte twice during peak wildflower bloom. It was nothing short of amazing, but the locals said it wasn’t that good… I thoroughly enjoyed it though! This was taken up on Kebler Pass, near the top close to the Horse Ranch Park area. Although I couldn’t quite capture the beautiful sidelighting I saw, it still remains a favorite of mine for the year. 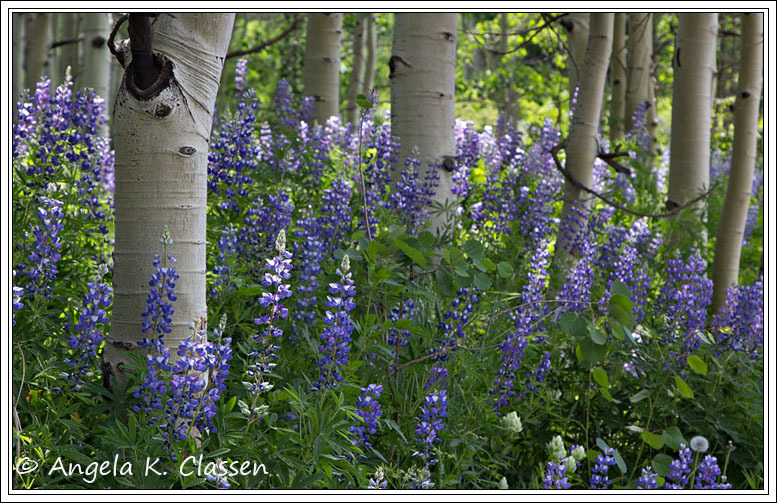 I really liked the strong vertical lines created by the aspens and the lupine spikes. Thanks to Thunder Mountain Camera Club, and especially Dawn Morrow, I expanded my photographic horizons a bit this year with some night photography, which I had never really tried. 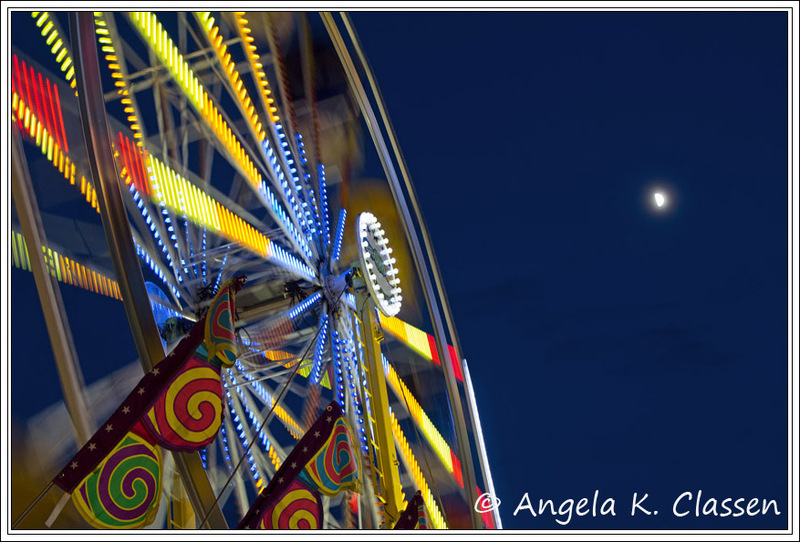 In addition to Christmas lights, and attempts to shoot lightning, I also tried my hand at the Mesa Co. Fair and the midway after dark. Again, several camera club members attended and we had a blast first shooting the rides as it got dark, and fireworks after dark. I really liked this image – it just looks fun! 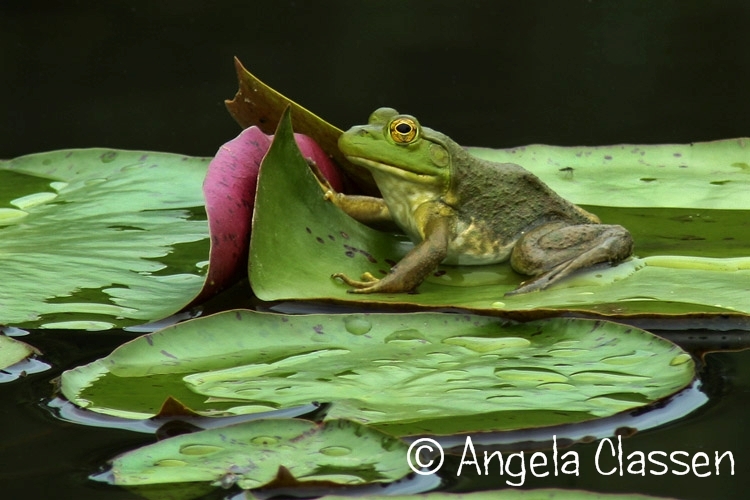 I posted this on Nature Photographers Network in the POP (People, Objects & Places) category and received an Editor’s Weekly Pick, which was exciting for me. I loved the color combination of yellow sunflowers and purple lupine and tried to shoot the two together as much as I could. 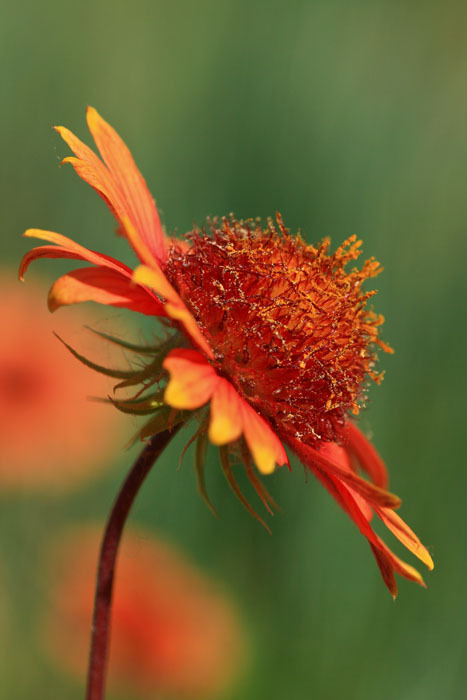 This was my favorite wildflower image of the year. 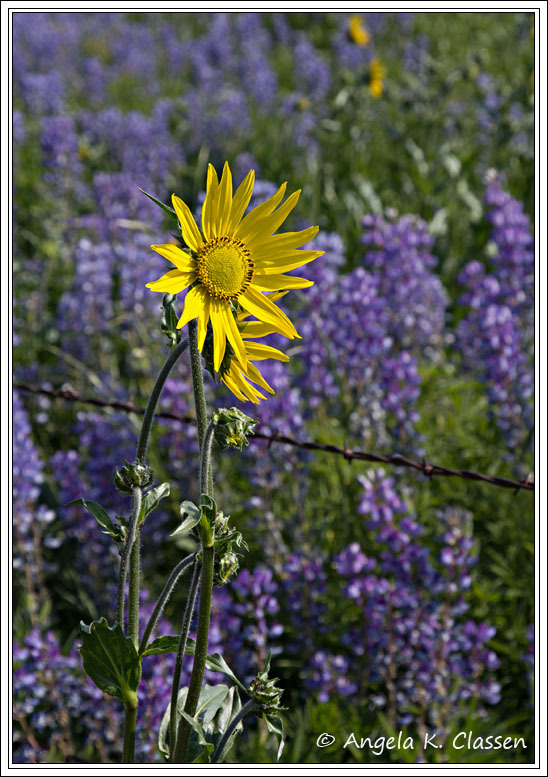 The lupines provided such a pretty background to this happy, cheery sunflower. Sunflowers, of course, are my favorite flower. This fall I decided to brave the crowds and headed up to the Bells, just shortly before the government shutdown. I left home at around 3 am and arrived at the parking lot, to discover there weren’t many spots left. I grabbed one and waited, hoping it would warm up a little. Finally, after watching dozens of photographers heading down toward the lake, I decided I should go too. It was terribly cold, and unbelievably crowded. I knew it would be bad, but didn’t realize HOW bad until I witnessed it in person. I was standing literally elbow to elbow with hundreds of other photographers, and vying for space where tripods wouldn’t show up in my shot. (Actually, I had to clone out a tripod in this shot near the rocks.) Sunrise over this location was incredible. It is a photographic icon for a reason – it’s drop dead gorgeous with the dramatic peaks and a mirror lake in the foreground. After the sun rose, I hiked up to Crater Lake, which was very windy. If I ever do this again, I’ll get there even a bit earlier and stake my spot out on the lake shore sooner. I was pleased I got what I did and made the best of it. Yet another highly photogenic icon spot I can cross off my bucket list! I’d been here numerous times, just never at sunrise. Silly me, I decided to head there on a day when the temps were about 5 degrees BELOW zero! The good news was I didn’t have to fight so hard for a spot. Although there were 5 photogs set up by the time I arrived about 10 min. before sunrise, I managed to get some decent shots. It really is quite amazing to witness the underside of the arch glowing as soon as the sun peeks over the horizon. Again, it’s an icon for a reason. I couldn’t have timed my trip to Steamboat better. Fresh fallen snow AND peak color combined for the most amazing day of photography I’ve ever had. This was shot on the road up to Crosho Lake. What caught our attention was the combining lines of frosted evergreens and vibrant foliage. Although not touted as a prime fall foliage location in Colorado, I was amazed. The Flat Tops are gorgeous, as is the Buffalo Pass area, Hahn’s Peak, etc. You owe it to yourself to check it out next fall. Once again in May, I went to the spring fling event put together by my friend and fellow NPN’er Bret Edge. It was a small group this year, but we had a grand time shooting sunrise at Canyonlands, eating lunch together, then meeting up again in the evening. 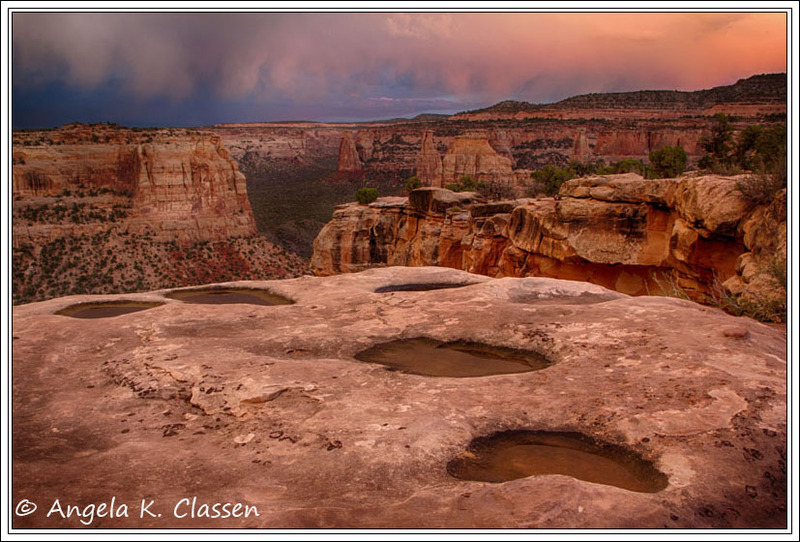 The evening location was False Kiva, which involves a hike down the cliff on an unmarked trail. I would not recommend trying to find it on your own, but would suggest you find someone who has been down it before and go with them as it looks like you could easily get lost in the rocky sections in places. We ran into a French photographer who was coming back, and he told us (in his very snotty French accent) that “Ze light is gone.” We all chuckled and kept trudging on. Although the light wasn’t the best when we arrived, it did burst through some clouds right at sunset! Shutters were clicking away wildly. The clouds in the background were the perfect backdrop for the sunlit cliffs and formations. This alcove and ruin is absolutely amazing, almost spiritual. I almost didn’t go on this hike as I thought it would be too much for me, but with some gentle encouragement and not so gentle arm twisting from Bret and the others, I decided to go for it. Am I ever glad I did! It was a tough hike, but blessedly it wasn’t very long so it was totally doable. Those who know me well know that I’m really not a morning person. However, when properly motivated, I can get up early for a photo shoot. I shot this from the Ute Canyon overlook in Colorado National Monument. On my way up here, I had already witnessed a morning rainbow so I knew something special was going to happen. The light and clouds combined for a gorgeous shot of Ute Canyon, which is a really fun hike as well. This year I also started using NIK HDR Efex on some of my images, including this one. The program is awesome because you can totally control all the sliders and make it look as garish, or as natural, as you’d like, while boosting the saturation, contrast and making clouds pop. (Since I prefer a more natural look, I really dial back a lot of the HDR elements.) I also used HDR on the False Kiva image as well, which really made the sky look incredible. 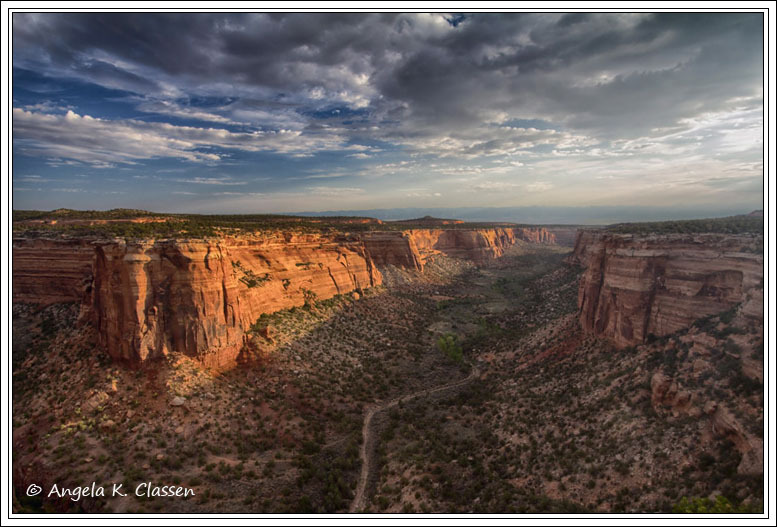 On yet another outing with the Thunder Mountain Camera Club, we went up to the Colorado National Monument in early May for a sunset walkabout and shoot. Naturally, the group had fun exploring the rim of Wedding Canyon and shooting from the Book Cliff View areas. A rainbow appeared just shortly before sunset, then the light show exploded! We were all speechless as the colors reflected and changed. What incredible pinks and purples! The potholes had just a tiny bit of water in them too, which definitely added interest to the scene. This image has been selected as one of 50 pieces to show in the Monumental Art Exhibit, which will be at the Grand Junction City Hall from January 10 through March 31. I’m very proud this image passed muster with the jurors and will be a part of this show. I also used HDR on this image to make the clouds and colors stand out a bit more. Finally, we’re down to my favorite image of the entire year! 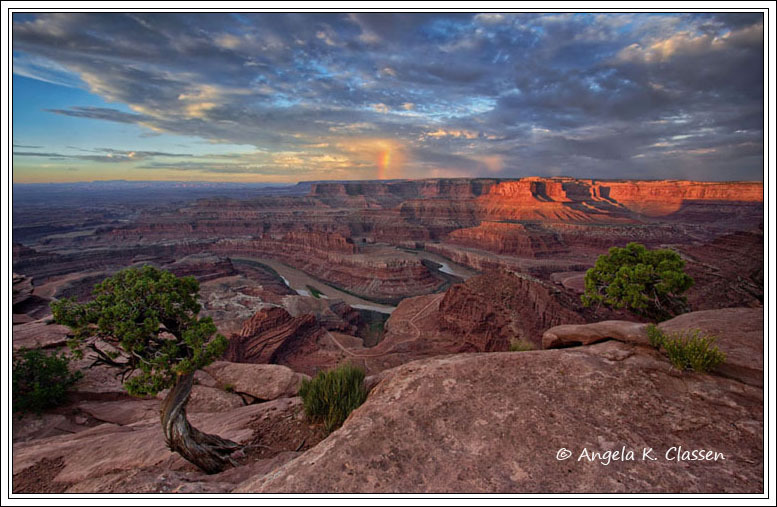 In late August I decided to head to Dead Horse Point State Park in Utah. I was dismayed when it started to sprinkle on me on the way there, but the clouds seemed to be breaking up. When I got there, I was very happy to see I’d have enough clouds in the sky to make the view more interesting. As the sun started to rise, I was absolutely ECSTATIC when the short little rainbow appeared! I only saw one other photographer there and I’m sure he was stoked too. (I almost did a happy dance but was afraid I might fall over the edge!) 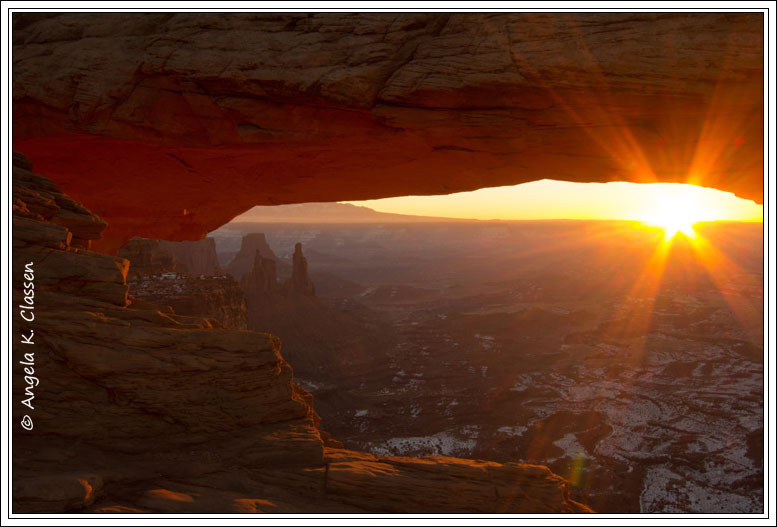 Sunrise at DHP is always amazing, as the sun hits the different levels of cliffs and lights them up in succession. It really is quite a spectacle, one that was enhanced by the great rainbow this day. I also used HDR on this one as well with what I think is a very natural look to the finished image. I joined Thunder Mountain Camera Club this summer and have had a blast! I love the networking with other local photographers, the learning opportunities, the competitions, and especially the outings. 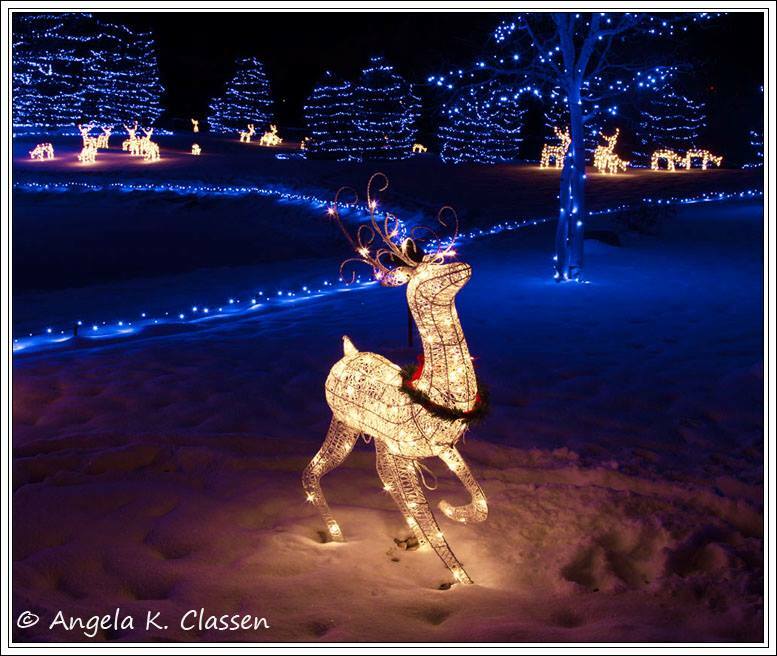 We went to the Monument, Grand Mesa, the county fair and several locations for Christmas lights. Hanging with new people has challenged me to try different things and techniques. I can’t wait to see what next year brings! 2013 was an awesome year for me. I received two Editor’s Weekly Picks from Nature Photographer’s Network for my Mesa Co. Fair image in the POP photo category and my Horsethief Ranch image in the Weekly Challenge category. In November, my portfolio was chosen as NPN’s Gallery of the Month, which includes the cream of the crop of photographers on the forum. I feel very honored I was chosen. 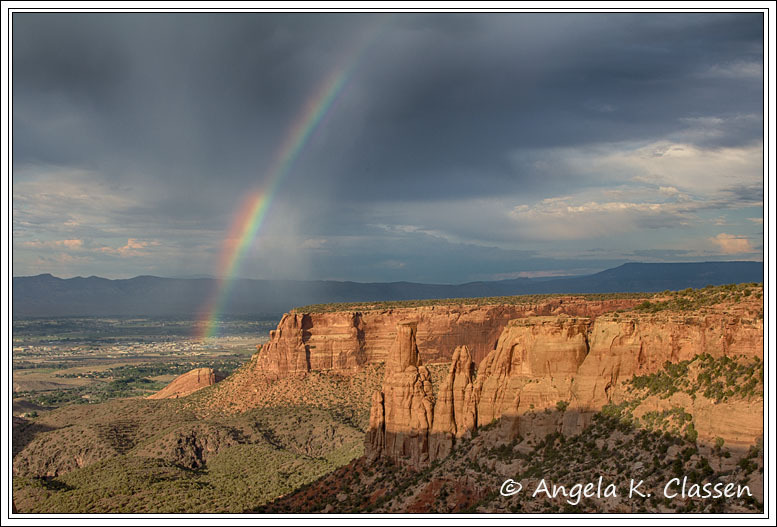 The Colorado National Monument Association selected 5 of my images for their annual calendar (which is their big fundraiser for the year), and one of those images was used for the large photo for June. (This was the first time I got a large monthly photo.) I received an Honorable Mention in the “Behind the Lens” contest sponsored by the Daily Sentinel for my Horsethief Ranch image. The Mesa Land Trust used my Horsethief Ranch image on their printed and internet invitations to their annual open house. The Bank of Colorado selected Foggy Kissing Couple for the large January photo in their annual scenic calendar. Three of my images were selected by Thunder Mountain Camera Club to be entered in PSA competition, and one of those images received an Honorable Mention from PSA. 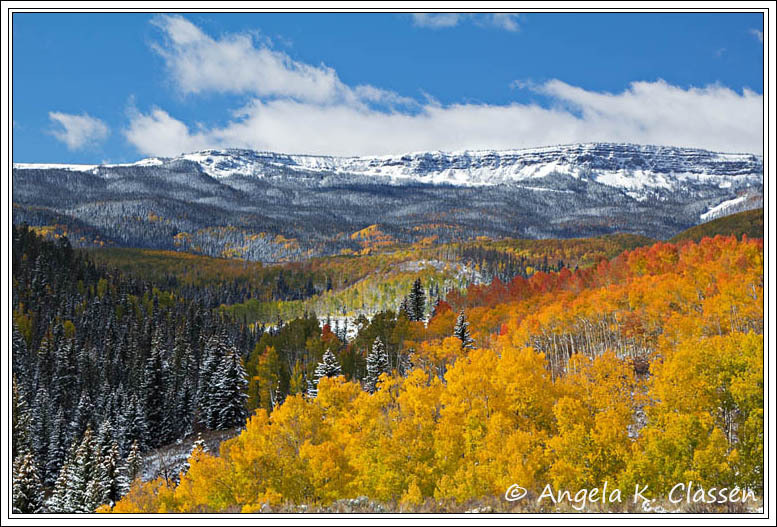 I was asked by Larry Bennett of Aspen Photo Art Gallery to exhibit my images, which will start in January. And last, but not least, Pothole Sunset was selected by the jurors of the Monumental Art Exhibit to be one of 50 pieces to exhibit at City Hall beginning on January 10. Yes, it has been a good year for me, and I hope I can somehow top next year, but that’s going to be a tall order! I don’t really like resolutions, but I do have a few goals photographically this year. I need to continue to broaden my horizons, try new things, and keep learning and improving. I believe my involvement with the local camera club will help in obtaining these goals. I must go through my catalog of images and DELETE, DELETE, DELETE! My poor hard drive is groaning from all the weight of the thousands of images I’ve shot in the past 3 years. I’d like to break out my “how to” books and learn more post-processing techniques for Photoshop and especially for my new NIK suite of programs. I’ve used the HDR a little and love it! I also need to keep submitting images for consideration in calendars, magazines, contests, etc. and learn how to better market myself and my images. Again, I have a couple of “how to” books that I’ve browsed through, but really need to dig in and read them. Last, I hope to start posting more on my blog this year. I hope all of you had a great year, and I wish you another successful photographic year in 2014! I’m honestly a very modest person (just ask anyone who knows me personally) and my blog is really the only outlet where I can toot my horn a little bit. Sorry if this is offensive to anyone. I like to cherish my life’s accomplishments, small though they may appear to others.